It seems at first weird that we might learn from him. Thomas Aquinas was a medieval saint, said in moments of high excitement to levitate and have visions of the Virgin Mary. He was much concerned with explaining how angels speak and move. And yet he continues to matter because he helps us with a problem which continues to bedevil us: how we can reconcile religion with science and faith with reason. Aquinas was both a philosopher and a holy saint. Refusing either to lose his faith or mindlessly believe, he developed a new understanding of the place of reason in human life. Aquinas’s monumental contribution was to teach Western European civilisation that any human being – not just a Christian – could have access to great truths whenever they made use of God’s greatest gift to human beings: reason. He broke a logjam in Christian thinking, the question of how non-Christians could have both wisdom and at the same time no interest in, or even knowledge of, Jesus. He universalised intelligence and opened the Christian mind to the insights of all of humanity from across the ages and continents. The modern world, in so far as it insists that good ideas can come from any quarter regardless of creed or background, remains hugely in his debt. Thomas Aquinas was born to a noble family in Italy in 1225. As a young man, he went to study at the University of Naples and there came into contact with a source of knowledge which was just then being rediscovered: that of the Ancient Greek and Roman authors, who had previously been shunned by Christian academics. At university, Aquinas also came under the influence of the Dominicans, a new order of monks who, unlike other groups, believed that they should live in the outside world, rather than a cloister. Against the will of his family Aquinas decided to join the order. His family’s questionably pious response was to kidnap him and lock him in a tower they owned. Aquinas wrote desperate letters to the Pope, arguing his cause and pleading to be set free. However, the pope was busy with political matters, and so Aquinas stayed locked up, and passed the time writing letters to Dominican monks and tutoring his sisters. According to one legend, during this time Aquinas’ family even furnished him with a prostitute in a low-cut top in the hopes of seducing him away from his idea of being a monk, but Aquinas drove the young lady away with an iron bar. Seeing they were getting nowhere, finally, his family unlocked the door and the (in their eyes) wayward Aquinas joined the Dominican order for good. Resuming his interrupted education, Aquinas went to study at the University of Paris, where he was a remarkably quiet student, but an exceptionally prolific author, writing nearly two hundred pieces about Christian theology in less than three decades. His books bear beautiful and strange titles the ‘Summa Theologica’ and ‘Summa contra Gentiles’. He also became a hugely popular and influential teacher, and was eventually allowed by the Dominican leadership to found his own school in Naples. Such was his devotion to knowledge, even at the moment of his death (at the age of forty-nine), he is reputed to have been in the middle of delivering an extended commentary on the Song of Songs. After he died, he was canonised in the Catholic Church and is now the patron saint of teachers. Many great philosophers were pagans, Aquinas knew, but this did not bar them from insight because, as he now proposed, the world could usefully be explored through reason alone. To explain how this could work, Aquinas proposed that the universe and all its dynamics operated according to two kinds of law: ‘natural law’ and divine ‘eternal law’. For Aquinas, many ‘laws’ could be worked out from our own experience of the world. We could find out for ourselves how to smelt iron, build an aqueduct or organise a just economy. These were the natural laws. But there were other revealed ‘eternal’ laws: that is, things which reason could not arrive at on its own. To know (as he thought) that after our deaths we would be judged by a merciful God or that Jesus was simultaneously human and divine we would have to depend upon revelation in sacred books: we’d have to take them on trust from a higher authority. The radical move Aquinas was making was to allow important space for ‘natural law’ too. He was standing up for the importance of personal observation and experience. His worry was the Bible was such a prestigious source that it could swamp observation: people would be so impressed by revelation from authority that they would discount the power of observation and what we can discover on our own. The point Aquinas made was that both natural and revealed eternal law are important. They are not – he argued – essentially opposed. The problems comes when we insist exclusively on either one. Which we need to develop depends upon the bias we currently have. Today the tension between higher authority and personal experience remains, though of course the today ‘revelation’ by a higher authority doesn’t mean consulting the Bible. It means organised science. The modern version is the refusal of any kind of knowledge that doesn’t come with the the backing of experiments, data, mathematical modelling and peer-reviewed journal references. The arts, literature and philosophy are today in the position Aquinas defined for natural law. They attempt to understand the world on the basis of personal experience, observation and individual thinking. They don’t come the stamp of higher authority (meaning, now, science rather than the Bible). 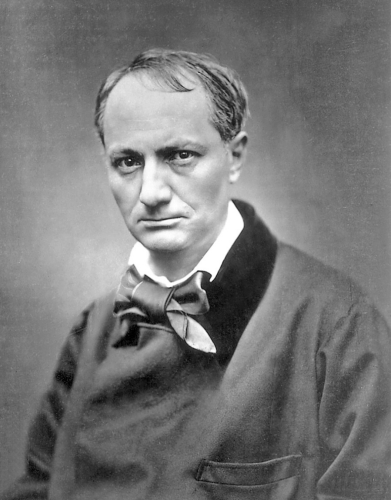 When Baudelaire declared that ‘Genius is childhood recalled at will’, he could easily be accused of intellectual deception. What research did he do to back this up? Did he consult all the available evidence (in diaries and biographical studies)? Did he look at studies of twins, one of whom was a genius and the other not in order to isolate the relevant factors? Aquinas’s contemporaries were broadly aware of the Ancient Greeks and Romans but they took the view that ‘pagans’ simply could not have anything important to say on any topics that they felt really mattered to them. It wasn’t the fault of the ancients – they lived before Jesus. But they were held to be in error on the single most important issue of life: religious belief. This seemed so terrible a flaw that nothing else the pagan philosophers thought could be in any way useful or important. Aquinas argued that people who are misguided on some fundamentally things can still have a lot to teach you. He was diagnosing a form of intellectual snobbery. We have a tendency to dismiss a given idea because of its background : we feel we won’t listen unless it comes from the right place. We might define ‘the right place’ in terms of the labs at MIT rather than the Bible, but the impulse is the same. So today, an atheistic modernist sitting in London might find it incredible that they could have anything at all to learn from reading The Gospel of St John. The Bible, they think, is so obviously in error on fundamental points. It contains primitive mistakes about the origins of the word, it is filled with supposed miracles. Which is similar to the way medieval Christians felt about ancient pagan writers. The key point for Aquinas is that natural law is a subsection of eternal law, and it can be discovered through the faculty of independent reason. Aquinas gave as an example Jesus’s injunction to ‘Do unto others as you would have them do unto you’. Jesus may have given this idea a particularly memorable formulation, but it has in fact been a cornerstone of moral principles in most societies at all times. How is this possible? The reason, Aquinas argued, is that natural law doesn’t need God’s direct intervention in order to make itself known to man. Just by reasoning carefully, one is intuitively following God’s intentions. Aquinas allowed that in a few situations God works simply through divine law, outside of the limits of human reason; and gave the example of prophetic revelations and the visits of angels. However, most useful knowledge could be found within the realm of natural law. Aquinas’s ideas unfolded at a time when Islamic culture was going through very similar dilemmas as Christianity, in terms of how to reconcile reason and faith. For a long time, the Islamic caliphates in Spain, Morocco, and Egypt had flourished, generating a wealth of new scientific knowledge and philosophy. However, due to the increasing influence of rigid religious leaders, they had become more dogmatic and oppressive by the time Aquinas was born. They had, for example, reacted violently against the Islamic philosopher, Averroës (Arabic name Ibn Rushd). Like Aquinas, Averroës had been deeply influenced by Aristotle, and had argued that reason and religion were compatible. However, the caliphates – anxious never to depart from the literal words of God – had made sure Averroës’ ideas were banned and his books burned. Aquinas read Averroës, and saw that he and the Muslim scholar were engaged on similar projects. He knew that the Muslim world’s increasingly radical rejection of reason was harming what had once been its thriving intellectual culture. It was partly thanks to Aquinas’ ideas that Christianity did not suffer the same process of stultification as Islam. Though Aquinas was a man of deep faith, he therefore provided a philosophical framework for the process of doubt and open scientific inquiry. He reminds us that wisdom (that is, the ideas we need) can come from multiple sources. From intuition but also from rationality, from science but also from revelation, from pagans but also from monks: he’s sympathetic to all of these; he takes and uses whatever works, without caring where the ideas come from. That sounds obvious, until we notice just how often we don’t do this in our own lives: how often we get dismissive if an idea comes from an (apparently) ‘wrong’ source: someone with the wrong accent, a newspaper with a different political creed to ours, a prose style that seems too complicated, or too simple – or an old lady with a woolly hat.